Looking at my kit list leaves me thinking about knives. I remember a thread on an outdoors forum last year where someone asked if people carry knives when they're backpacking. The opinions on the thread were very polarised. People either do or they don't. Those that do wouldn't be without one and those that don't can't see any reason to carry one. I do. I always carry a knife when I go backpacking. I always have done, I guess it's something that goes back to my time as a Boy Scout many years ago! We learnt how to use a knife safely in those days. Usually it's my folding Victorinox camper, which I like because it has features that I use regularly such as a can opener and corkscrew. I find it useful for slitting boil in the bag rice, and preparing food for instance. The other knife I have is the one above. 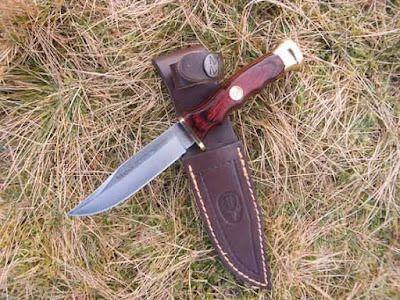 It's a Spanish-made (Muela) mini Bowie knife. The blade is about 3" long and it is a very nice thing to use. It will be going to Sweden with me again. If I didn't take it, how would I clean all the fish I never catch?